You are here: Home / Foot Care Blog / Toenail Fungus / Yellow Nails: Toenail Fungus or Onychatrophia? What Does Onychatrophia Look Like? We’ll save you from the image if you’re squeamish, but the curious and brave can see a photo of the nail disorder here. There are varying degrees of nail atrophy. 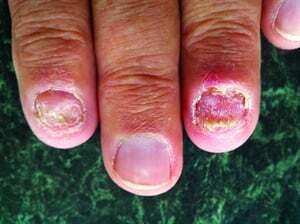 Some people have only one affected nail that has partially atrophied, but will never worsen because the underlying condition has come and gone. Other people may have such a bad case of onychatrophia they lose all their nails. Generally speaking, the nail will look yellowed and crumbled around the edges, usually with striations and raised portions. 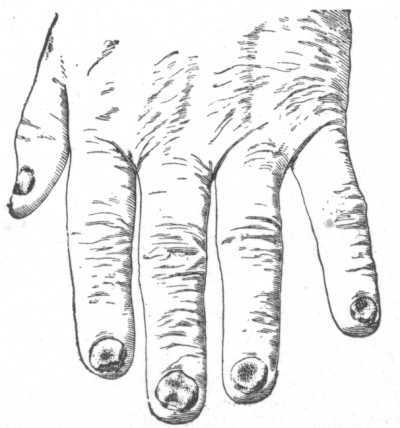 The shape of the nail becomes distorted, the nail detaches from its bed, and pus is often present. Doctors can determine nail atrophy just by looking at it. Nail atrophy may be mistaken for nail fungus, but it can be caused by many different underlying problems. Nail techs need to be particularly careful when they come across onychatrophia. When the nail bed is so thin and damaged, simply buffing the surrounding area could cause a secondary infection. Unfortunately, once a nail has been completely destroyed by onychatrophia, it can never be repaired. Your best hope is to catch the atrophy early and see a dermatologist who can identify and treat the root cause of the problem. Half the time, yellow, crumbly nails are caused by toenail fungus. What If It Is Just Toenail Fungus? About half the time, a nail dystrophy is caused by a fungus. Often, a trained eye will detect toenail fungus by appearance. To be sure, a podiatrist, dermatologist, or physician may scrape a small sample from beneath the nail and test it in the lab. Unfortunately, toenail fungus is not an easy condition to treat either. Topical treatments are tedious and prove futile, as creams and lacquers cannot adequately penetrate to the nail bed. Oral treatments come with the unfortunate risk of serious side effects — like liver damage or permanent taste loss. Laser toenail fungus treatment is expensive and not covered by insurance. Whatever method you choose, you will need to exercise supreme patience and wait until the nail fully grows out to be rid of it. During that time you also need to make sure you do not accidentally re-infect your recovering nail. The most common way people re-infect their nails is by putting their feet into contaminated shoes. Fungi can live in a dark, damp environment (like your footwear!) for months. Therefore, we recommend using the SteriShoe UV shoe sanitizer to kill up to 99.9% of the fungi and bacteria living in your shoes in just one 45-minute pass.